Is smaller always more beautiful? The S3 Mini ticks all the right boxes, and comes in at a very decent price. The truth of the matter is, though, that it's launching right smack bang against the Google phone, the Nexus 4. Would we recommend buying it over the Nexus? Not really. The announcement that Samsung has sold the most phones, and in particular more than double the amount of iPhones, will no doubt be of little shock. The Samsung Galaxy S3 was the most popular selling smartphone in Q3 2012, following in the footsteps of its older brother, the now 18 month-old Samsung Galaxy S2. One of the secrets of Samsung's success has to be the quality of its devices, but another is that it has targeted every corner of the market. The Samsung Galaxy range has hit every price point, from the super-budget Galaxy Y to the highest end phablet Galaxy Note 2, and the Samsung Galaxy S3 Mini here falls somewhere in the middle. Samsung will look to the success of the Galaxy S3, as the Galaxy S3 Mini - also referred to as the Galaxy SIII Mini - comes up against the newly launched LG made Google Nexus 4, that has completely rewritten the book for mid-priced smartphones. It also faces some stiff competition from more established handsets such as the HTC One S, and the ageing yet still very popular Samsung Galaxy S2. Remarkably, like the Nexus 4, the Samsung Galaxy S3 Mini comes in with a similar spec sheet as the iPhone 5. But it hits the price point of the two years older iPhone 4, at £315 (around AU$460/US$480) SIM-free, or free on monthly contracts from around £25 (around AU$38/US$40) per month in the UK. After a quick glance at the Samsung Galaxy S3 Mini you'd be forgiven for mistaking it for its larger, higher end brother, and that is in no way a bad thing. The plastic feeling that we mentioned wouldn't appeal to all on the S3 feels right at home on the S3 Mini. It even comes in the same Pebble blue and Marble white variants that the Samsung Galaxy S3 launched with. Measuring 122.55 x 63 x 9.9mm (4.82 x 2.48 x 0.39 inches), the Samsung Galaxy S3 Mini is by no means the largest phone, and it sits very comfortably in the hand. The 120g (4.23oz) weight also means it's not very noticeable in the pocket, even if it is a whole 1.3mm thicker. There's no doubting that the Galaxy S3 Mini looks superb, its size being the only initial indication that it wasn't intended to be a market-leading phone. In fact, we are left wondering where the compromises have been made. The two main areas are the processor and the screen, with the dual-core 1GHz chipset and a 4-inch WVGA resolution screen being a lot less spectacular than the Samsung Galaxy S3. We can forgive minor details like this, but given the 1.5GHz dual chip in the HTC One S, and the quad core power behind the Google Nexus 4, we're a little more sceptical. 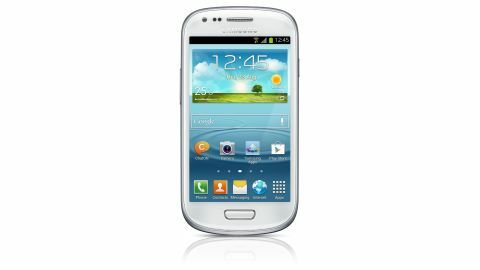 Elsewhere, Samsung has provided the Galaxy S3 Mini with the Android 4.1.1 Jelly Bean operating system, as well as a 5MP rear camera with flash, and a VGA front camera. As we mentioned, the Galaxy S3 Mini sits very well in the hand, its smaller size meaning that it is a lot more comfortable to hold than the Samsung Galaxy S3. The lock/power button sits on the right side, with the volume key directly opposite on the left. The phone's small size makes them all very easy to hit one handed. The capacitive soft keys are out in traditional Samsung style, the Back and Menu buttons sitting either side of an elongated Home button just under the screen. Samsung has kept this layout since the original Galaxy S, and we are big fans, since it means that unlike the newer Nexus phones - the Galaxy Nexus and the Nexus 4 - there is no searching for the on-screen keys. Elsewhere on the front of the Galaxy S3 Mini are the speaker and the front-facing VGA camera for Facebook profile pictures, as well as video chats through the likes of Skype. The two main ports sit at opposite ends of the Samsung Galaxy S3 Mini, with the micro USB sat at the bottom (next to the microphone), and the 3.5mm headphone port on the top. This again follows the standard Samsung layout shown on other Galaxy devices, and we've never had a problem with it. The Samsung Galaxy S3 Mini comes with an advantage over other mid-range devices, since it has a removable battery cover, the Google Nexus 4 being the most notable exception. The battery cover makes up the entirety of the back of the Galaxy S3 Mini, and sits tightly on the back, so there's no chance of it popping off accidentally. The back of the phone is a smart white (or blue) affair, housing the 5MP camera sensor, a small flash, the loud speaker and the obligatory Samsung branding. Hidden behind the cover is the 1500mAh removable battery, which many heavy users will consider essential. Elsewhere is the SIM port (standard, not microSIM), and the microSD slot. Unfortunately the microSD isn't hot-swappable, which was a little frustrating. It's located behind the battery, and isn't a pop-in slot. This means needing to lay the microSD card flat against the Galaxy S3 Mini, and pushing it in, which can get a bit fiddly. In all we were very impressed with the design of the Samsung Galaxy S3 Mini, but we were more impressed with its more powerful predecessor, the Galaxy S3. The curved design sits very comfortably in the hand, and the smaller stature makes it easier to hold, with every part of the phone accessible one handed. For those looking for a stylish phone, who don't want a massive screen, a massive weight or a massive price tag, the Samsung Galaxy S3 Mini makes a more than promising first impression.